The concept of "melancholy" held a special place in English art of the 16th and 17th Centuries. Rather than being considered depressive mental condition, it was seen as a deeply poetic element of soaring ecstasy with the power to inspire even bigger, even better deeds. 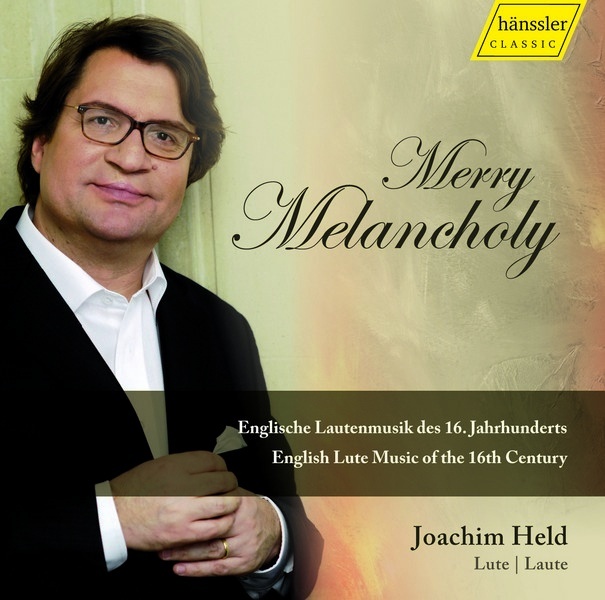 It is no surprise that the subject of "melancholy" came to characterize much of the English music for lute, and the inspiration for much complex and colorful music. Joyful dances, contrapuntal fantasies, and pavanes which luxuriate in chromaticism are all to be found here. Only the most beautiful, haunting works were chosen for this recording. Naturally, John Dowland is represented! His "Lachrimae" was a true international HIT in it's day, and Dowland capitalized on its success by providing numerous editions and arrangements. The program also features the work of other, lesser-known masters such as Francis Cutting, John Johnson and many others who brought the English Lute School to its highest development around 1600. Oh, Merry Melancholy! After having explored the repertoire of France, Italy, Germany and Austria, Joachim Held now presents this CD of English lute music. Throughout these recordings, he has shown not only the diversity which then prevailed in Europe, he also presented his own amazing abilities and stylistic flexibility and mastery of different musical idioms. It shows once again that Joachim Held is one of the best lute players in the world.